There isn't room enough on this website to provide the entire contents of Brigham Young's Office files (over 40,000 pages of correspondence), but here's the index to them (which is over 160 pages, click the orange button above). The indexes are roughly in alphabetical order, prepared by a process called optical character recognition from a recent publication called Selected Collections from the Archives of the Church of Jesus Christ of Latter-day Saints, Volume 1 Disk 24. Do you have an ancestor who was alive between 1851 and 1878 who may have received a letter from Brigham Young? This is most likely if that relative was an LDS Church leader--such as a Bishop, but it certainly doesn't stop there. President Young served many functions in Territorial Utah, the role of prophet being only one of them. Make a list of ancestors with whom it is possible that Brigham corresponded and find out. In my case, I checked 16 last names of Mormon relations, and of those, 3 received letters from Brigham Young. These are office files, so Brigham Young is not always the author of the letter, in fact his office frequently sent letters to him, supposedly when he was away from Salt Lake City. Many letters were written to members and missionaries of the LDS Church giving advice on various subjects; there were also many letters written to non-members of the church living in the United States and other countries, answering questions and informing them on whom they could contact to learn more about the church. You will note that there are also many letters to persons famous in history, such as authors, editors of Eastern newspapers, railroad officials, Indian chiefs, politicians, government agents, ministers, and explorers. If you haven't already, to search this index click the orange button provided above. It is recommended that you first wait until the document completes loading, which may require several minutes (you're loading 1.2 megabytes). On your keyboard, next press Ctrl f, then enter the name of that person. Keep in mind that exact spelling was not a priority, and you are likely to see some very creative abbreviations. When you find a name, compare the font color and style to the list provided at the top of this page to determine which volume, box and file contains the letter. The LDS Archives also has the incoming correspondence, but this is not included on the DVDs. The DVD set may also be seen at the LDS Church Historian's Office in Salt Lake City, other research libraries that specialize in the history of the Western United States, as well as branch libraries of the LDS Family History Library in various cities (click here for more information). To read letters of Brigham Young to the Shoshone Indian chief Washakie, click here. 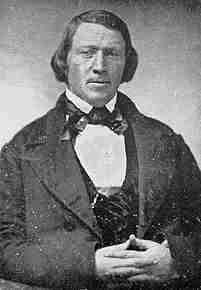 To read letters of Brigham Young to US Army officers during the Utah War, click here. Brigham Young University has gathered biographies of many early Mormons, click here. To return to the Tools page, click here.